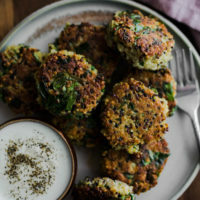 Spinach Quinoa Cakes with Garlicky Yogurt | Naturally.Spinach Quinoa Cakes with Garlicky Yogurt | Naturally. Quick and delicious quinoa cakes filled with spinach. A perfect hand-held snack, salad topper, or light dinner. Combine all the ingredients in a bowl and stir to combine. Let rest for 20 minutes. While waiting, make the yogurt sauce. Combine the ingredients in a small bowl and stir to combine. Let sit while frying the fritters. When ready to fry, heat a large skillet over medium-low heat. Form the quinoa mixture into small, 2” patties that are about ½” thick. Place in the pan and fry on each side for about 3 to 4 minutes. The fritters should be golden and crisp. Serve with the yogurt and more herbs as desired. Tips + Tricks: If the mixture has trouble holding together, let it rest for about 20 minutes. Also, don’t be in a hurry to flip these. Let crisp and brown before attempting the flip.